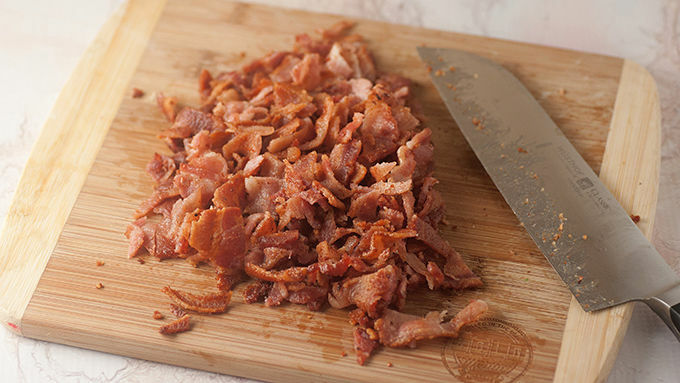 Fry the bacon in a large skillet over medium heat until crisp. Drain on a paper towel lined plate. Chop into small pieces. Add the pretzels to a food processor or blender and process until you have fine crumbs. Stir in the melted butter and sugar until combined. 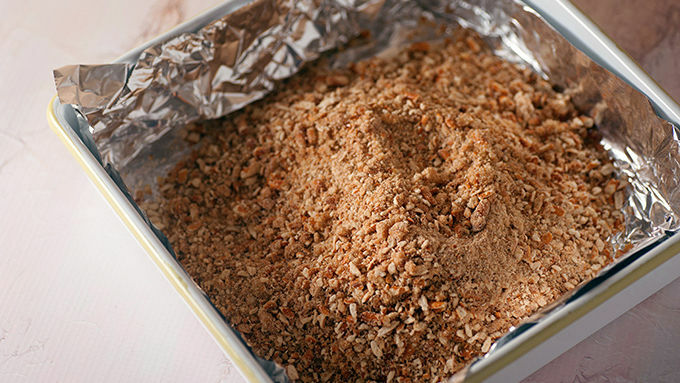 Line a 9x9-inch baking dish with foil and press the pretzel crumbs into the pan to form a loose crust on the bottom. 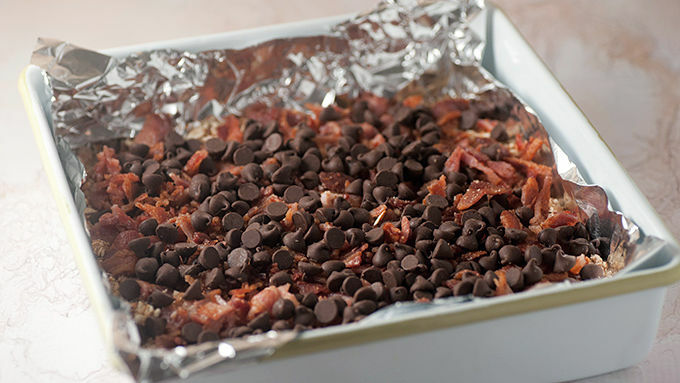 Top the pretzels with the chopped bacon and chocolate chips. Add the potato chips to a bag and use a rolling pin to crush them into small pieces. Sprinkle over the chocolate chips. 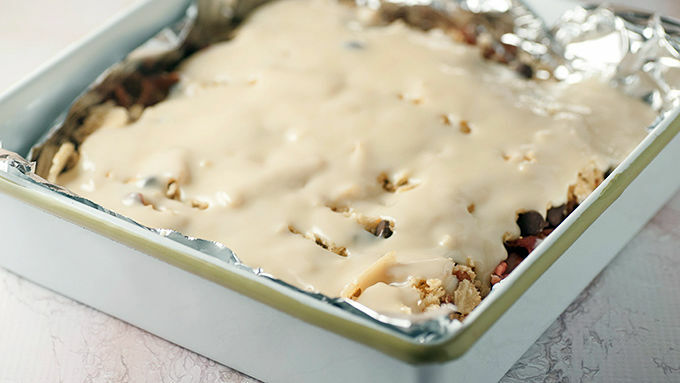 Drizzle the can of sweetened condensed milk over everything and place the pan in a preheated 350 degree oven for 20 minutes. Let cool on the counter for 20 minutes before chilling completely in the fridge. Once the bars are cooled completely, melt the peanut butter in a microwave safe bowl. Drizzle the melted peanut butter over the pan. Remove from the pan by lifting the edges of the foil out. Cut into 12 bars and serve. 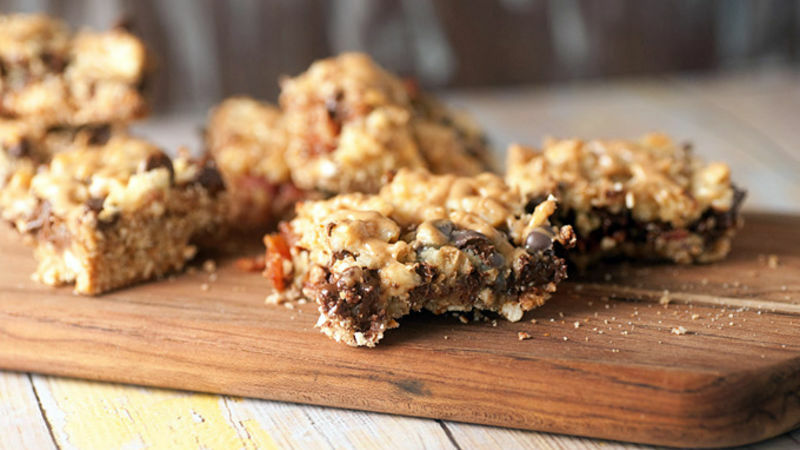 Perfect for late-night snack attacks, Father's Day, and just good ol' dude food - these Couch Potato Bars are a snack food lover's dream. Do you ever have those days when you want nothing more than to lay on the couch in your pajamas while watching bad television? Oh, always? Yeah, me too. The couch is my happy place. Especially when in pajamas with some ridiculous show on in the background. Throw in some chips or pretzels or maybe some chocolate, and I’m a totally happy girl. Which is why when I saw the Dude Food Magic Bars from SugarHero I knew that my life would be forever changed – for the better. I mixed things up just a bit to suit my tastes, and these bars? They are outrageous. Chocolate, caramel, bacon, pretzels, potato chips ... all good things on their own, but even better when baked up in a scrumptious, gooey bar! These are perfect for late night snacks and would make an amazing Father’s Day dessert. 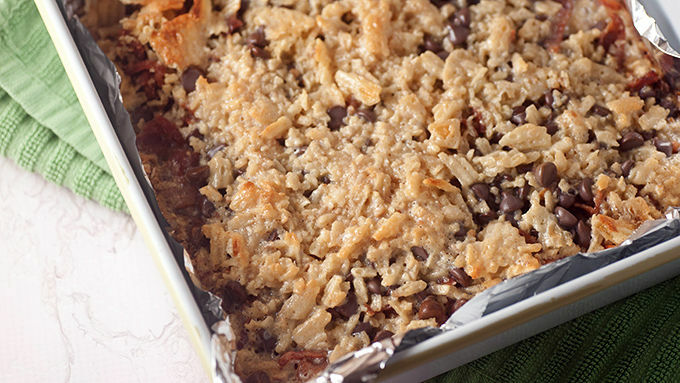 You’ll need crispy fried bacon, pretzels, chips, peanut butter, sweetened condensed milk, and chocolate chips. You’ll also need a bit of butter and sugar. You’ll want to chill them completely before drizzling on some melted peanut butter. Let that firm up and then slice, devour, and enjoy your food coma!